Encryption protects your files' content and nothing more. It could protect the GRF's file table, but then you wouldn't be able to update your GRF with patchers... unless you made a custom patcher! Bugreport related to GRF Editor & Encryption. some of grfs have redirected indexes. i'm add some grf to encryption, (do not modify client), and when i replaced encrypted grf with the old one -> client imposible to start. The reason of this problem was in folder name where Ragnarok online files stored. My folder name contains russian characters + "spaces". After renaming to "only english characters name of the folder without spaces", all start to work fine. 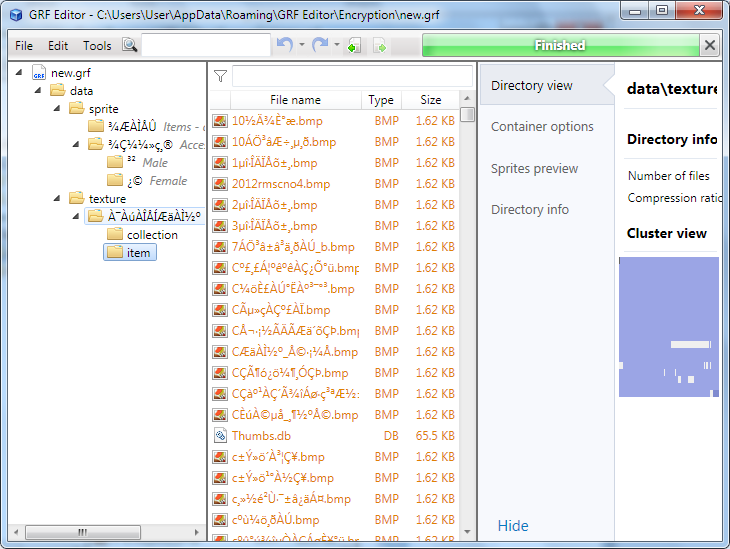 GRF Editor + GRF Encryption with 2012-04-10 wont start the game client at folders, where russian characters exist. Is there a full change log? Changelogs can be found in the first page description (may not be updated though). This Gat Editor had no reason to be in a GRF editor so it's been removed. Dear Tokei, please take a look about problem above. Hello, it is possible to fix this LUA function in GRF editor ? I have tested with 2014-04-16a and its works. 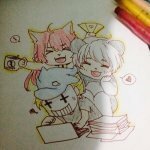 @Tokeiburu. I have some question. How to update grf with encrypt grf ? Its true the step I make ? Is my custom maps will encrypt same with other files ? I just need confirmation. Thanks you. I haven't fully tested this method (I usually use Thor files for patching instead). But yes, it will encrypt the files you selected in the GRF and overwrite or add those to your server's default GRF. Sir help me. I have separate my item.grf, I have secure it with your security. May I know why all my item.grf got corrupted? I want you to build a new feature in the grf editor. view file .str animate and export to png or gif. Going to need a lot more information. You can't view encrypted content, that's a given. i already encrypt my grf but error is string buf? Can you add a right mouse click menu option that save all my select search result files as a grf file? Oh cool, you figured out thor format. I took a glance your implementation, it seems fine. One recommendation though. The "Mode" you are referring (0x21, 0x30) is actually version number. While there are earlier versions, they are already dropped. The plan is drop out 0x21 in the future. So even for patching patcher and client, use 0x30 is good enough. The reason I use 0x21 in thormaker only because when 0x30 came out, people needs upgrade old patcher but those of course won't able to read it. All the version after that will recognize it, there is no special treatment during patching. And what happens after all these years? "If it's not broken, don't fix it" (terrible btw). So always use 0x30 when creating thor file if that makes your life easier. Will there be any more format change? Maybe.. I do have some ideas floating around to have some kind extensible format, but I don't think it justify the needs right now. Will likely open specification if it ever happens though. dunno why grf editor can't decompile the official lub file, can you fix it? Heya, this .lub can be decompiled just fine. Are you sure you're using the latest version? Sorry, I didn't clearly elaborate it , Setting the encoding to 950 will get stuck, but works fine with encoding 1252. I have a question about the encryption function, it works when I'm using your tool and the program is asking for the key, however, when using gryff I can freely access the encrypted file. just because you can access it, it doesn't mean the files can be read. Thank you Ridley for clearing this up, my bad that I didn't try to open up the file after extracting it.